Would you love to make light, fluffy, tall scones? Look no further – Paul Hollywood’s best fluffy scone recipe is the one! It’s that time of year again folks…the new series of The Great British Bake off starts tomorrow night on BBC2, 8pm…and I can’t wait! I know a lot of people who love the show as much as I do and will be sharing my excitement! To celebrate this occasion, I decided to make Paul Hollywood’s scone recipe. I’ve wanted to try this particular recipe for a while now. I don’t make scones very often because they are usually a bit of a hit or a miss for me. I always longed to make big, so fluffy I’m gonna die scones but mine can turn out a bit…flat. So I was well chuffed with these beauties! They rose so high and were really light and fluffy. According to Mr Hollywood, the secret is in “chafing” the dough, which involves lightly folding the dough in half, turning it 90 degrees and repeating a few times until the dough is smooth. Scones require a light touch – so handle the dough with care! The recipe uses bread flour which I’ve never seen in a scone recipe before but it really works. I also figured out where else I was going wrong in my scone making – my dough wasn’t wet enough – it was too dry. It should have quite a sticky, wet consistency. Please don’t be alarmed by the amount of baking powder in this recipe – I promise it’s not a misprint! If you’re making scones then you’ll need something delicious to spread on them – you could make this 4 minute microwave lemon curd while you’re waiting patiently for the scones to bake! Or you could try my rhubarb and ginger jam recipe or my tangy rhubarb curd. If rhubarb isn’t your thing, I also have a great blood orange curd recipe. You could of course use normal oranges if blood oranges aren’t in season. 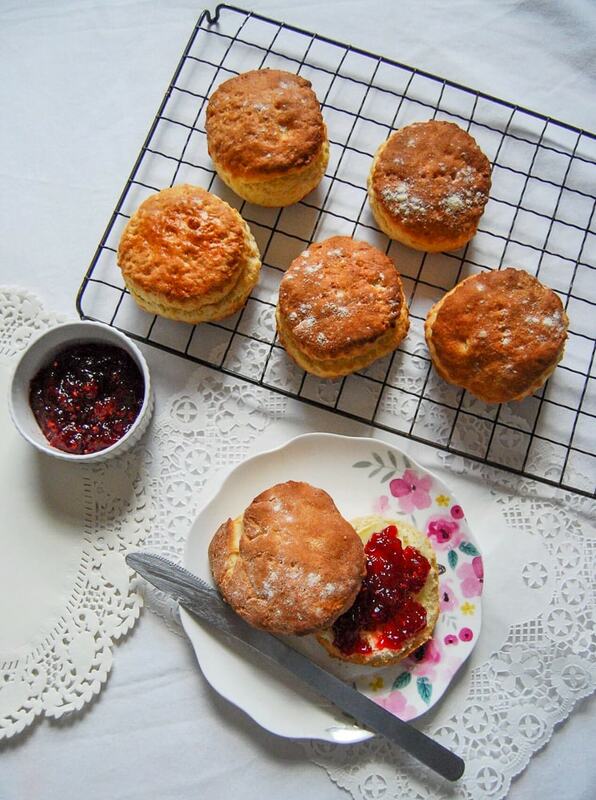 Looking for more scone recipes? Here’s my date and walnut scones recipe for you to try – they are so delicious spread thickly with butter. These salted caramel apple cinnamon scones are absolutely gorgeous – drizzle the the salted caramel glaze over the scones while they are still a little warm for an indulgent afternoon treat! They are equally as good thickly spread with blackberry jam or apple butter. If you’ve ever made scones that turned out like hockey pucks, give this recipe a try and I promise you will not be disappointed! The Best Fluffy Scone Recipe! I've tried dozens of scone recipes over the years and this one is BY FAR the BEST I've ever tried. The method may seem a little fiddly with all the folding and turning of the dough, but if you follow the method EXACTLY as below and handle the dough with care, you'll be rewarded with beautiful, tall, fluffy scones. 5 tsp baking powder Yes really 5 teaspoons – this is not a misprint! Preheat the oven to 220C/200Fan/428F. Lightly grease a baking tray with butter and line with baking paper. Place 450g of the flour into a large bowl and add the butter. Rub the butter into the flour until you have a breadcrumb like mixture. Add the sugar, eggs and baking powder use a wooden spoon to turn the mixture gently. Add half the milk and stir gently with a spoon to combine. Then add the rest of milk a little at a time until you have a very soft, wet dough. You may not need to add all of the milk. Flour a work surface (using the remaining four but keep a little back) and tip the dough out. Sprinkle with the remaining flour. The mixture will be wet and sticky. Using your hands, fold the dough in half, then turn the dough 90 degrees and repeat. This method is called “chaffing”. Repeat a few times until the dough is smooth. Take care not to overwork the dough. Next roll the dough out. Sprinkle more flour on the work surface and on top of the dough, then use the rolling pin to roll up from the middle and down from the middle. Turn the dough by 90 degrees and continue to roll until it’s roughly 2.5cm thick. “Relax” the dough by lifting the edges and dropping the dough back down on the work surface. Using a cutter dipped in flour, stamp out rounds from the dough and place on the baking tray. Don’t twist the cutter when pressing down, it could make the scones uneven. Leftover dough can be re-worked and re-rolled, but the resulting scones won’t turn out quite as fluffy. Place the scones on the tray and leave to rest for a few minutes. Glaze the scones with the beaten egg, trying not to let the mixture run down the sides. Bake for about 15 minutes, or until well risen and golden. For light and fluffy scones, it's very important to handle the dough with care. You don't want to knock the air out, so being gentle is key! Those look perfect! I would be very pleased too! Have only seen the American Great Baking Competition knock-off, but now want to see the original British series. I have already told HIM that we can’t go out tonight – UNLESS we get home in time to watch GBBO on BBC2 (9pm for us in Brussels) …. 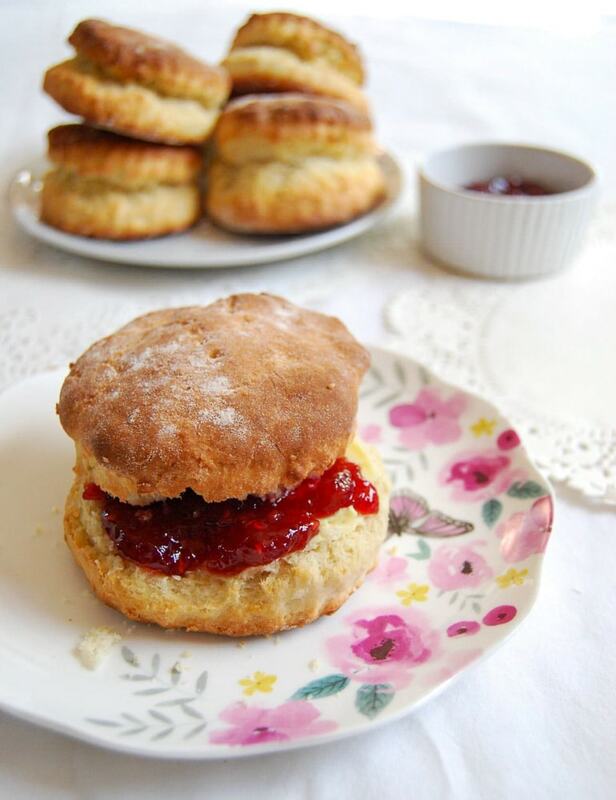 PS – these scones look AMAZING!! Always love trying new scone recipes! Did you really use five spoons of baking powder? Seems an awful lot to me, Wendy. Yes, really 5 teaspoons. I had to double check this, I thought it was a misprint. But it was right enough. It must be because the recipe uses bread flour. I love this recipe Nic! I’ve never made such lovely scones as these before. oh, I know this is an old post, but I must say I recently BINGED WATCHED the whole British Bake Off and loved each second of it… Scones are also hit or miss for me, often they turn as hockey pucks, but I am tempted to try your recipe, as I love Paul Hollywood in the show… such blue eyes on top of all that talent, right? I’m sorry Harry, I’m not sure. I’ve had a look online but can’t see anything. I wonder if it’s worth looking on Youtube to see if you can find the clip of Paul making the loaf? I will go through and convert measurement to cups, etc. But I will try this recipe. Now if I could find clotted cream here I’d be all set. WWE w e nt to the UK to celebrate our 50th Wedding Anniversary in April. I fell in love with afternoon tea and scones with clotted cream. Tobe able to re produce this treat would bring back wonderful memories until we can visit again. Thank you. Clotted cream is very easy to make, especially if you have a crock-pot. Search Pinterest for the recipe, but basically dump heavy cream (even ultra pasturised works) into the crock pot and leave for 8-10 hours on warm. Remove crock and leave to cool, then refrigerate. Once cold and set, skim off top layer and mix in with some of the remaining cream. Enjoy! It’s a great show isn’t it? Oh yes I have made those scones and they are absolutely delicious. They are definitely up there with some one of best scones ever! I love anything with maple syrup ? I’d love to try this recipe. Do you have American measurements? It’s something I’m working on Barbara, so watch this space ? No egg! And use lard for extra softness! I made these then I found a better recipe on the guardians how to make a perfect… all the best recipes use lard! Lovely recipe, I I would suggest substituting whipping cream (35%) for the milk based on my experiences with Rose Levy Berenbaum”s scone recipe from her Pie and Pastry Bible, which i have used for more than 15 years. Her recipe also includes three or four roll out and turns (chaffing) of the dough. The crumb on her recipes is wonderful. I have substituted either half and half or milk and neither compares to the cream. Love watching the TV show. That’s a great tip Judith, thank you! ? Rose’s books are on my wish list! 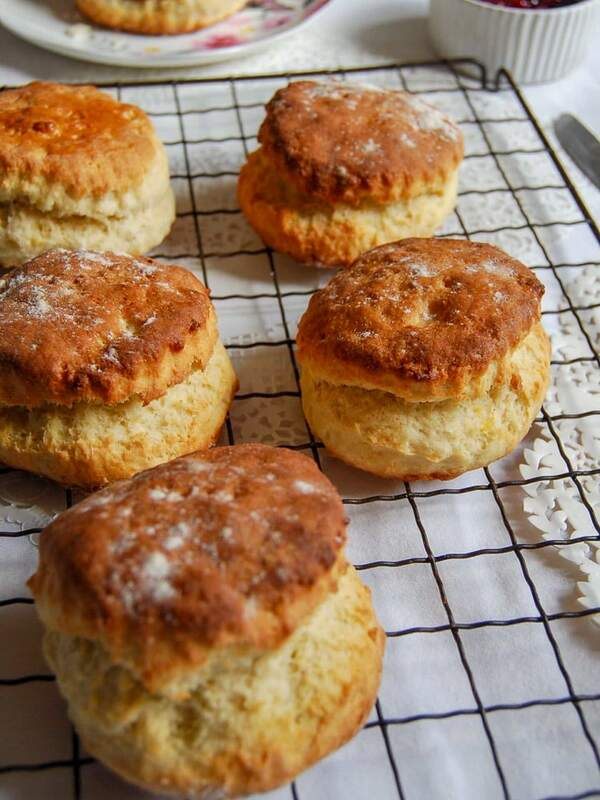 I am going to try this scone recipe all my scones turn out like biscuits, what strong flour do you recommend as I have never used it before. Hi Heather, I just use any supermarket branded strong white bread flour. I’ve also used Allinson’s with good results. Hi Sharon, I’m currently working on getting this information on my blog very soon, so watch this space ? Thank you!